According to the Frenchies at Le Blog Auto, the Nissan GT-R Spec-V has allegedly been delayed and is now expected to debut as late as next year. 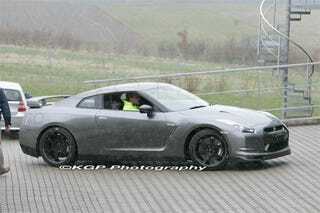 But rumors are also swirling of a new GT-R variant to be launched in the meantime. Although it's not to be confused as a Mitsubishi, some are throwing around a name of "Evolution" for this NISMO-tuned GT-R. Although we like the sound of NISMO goodies, can we really believe that'll be the name? More importantly, what else can we expect? Well, despite the name Evolution coming from the interwebosphere, this may be nothing more than an example of the name getting a little bit lost in translation as we're also hearing this mid-range GT-R may go by the more historically appropriate name of "S-Tune."